I was on the panel for the Green Media Roundtable Discussion organised by Green Drinks Singapore last week, where together with other environmental journalists and bloggers, we shared on Singapore’s journey towards sustainability – how far we have come these 50 years, and what else we can improve or focus on. I would divide the green movement in Singapore into 3 time periods: Before 2000 (Conservation and Protection); 2000-2010 (The Golden Age); and After 2010 (One Step Forward, 2 Steps Back). The focus by the government and NGOs before 2000 was on environmental protection and nature conservation. Many of our efforts in pollution control and creating green spaces were done by the government. Before 2000, there were 2 main green NGOs – Nature Society (Singapore) (NSS) and Singapore Environment Council (SEC). NSS focused on the green issues and were active in nature conservation, including advocating for Sungei Buloh and preventing the building of golf courses at Lower Pierce Reservoir. SEC focused on the brown issues, including green product labelling, and organising environmental activities and education. We think the period between 2000 to 2010 was the golden age of environmentalism in Singapore. We saw a proliferation of environmental NGOs and activism starting in Singapore, such as ACRES, Waterways Watch, ECO SIngapore, Green Drinks, and Ground-Up Initiative. The Chek Jawa saga in 2001 sparked off interest in our marine ecosystem and saw various nature and marine groups and activists emerging, such as Ria’s Wildsingapore, Siva’s RMBR Toddycats, Blue Water Volunteers, Hantu Bloggers, and many other nature bloggers. This period also saw various green policies and programmes started by the government, including the National Recycling Programme, the Energy Efficiency Promotion Office, BCA Green Mark for green buildings, NEWater and Water Wally by PUB, the Community in Bloom programme by NParks, and the first solar system installation in Singapore in 2008. Singapore published its Singapore Green Plan 2012 in 2002, and the Sustainable Singapore Blueprint in 2009 to guide us on our journey towards sustainable development. In 2006 and 2007, Al Gore’s efforts on climate change and the IPCC reports sparked off global and local efforts on climate change. Singapore published its first National Climate Change Strategy in 2008. We also saw major environmental events being organised by the government such as the Singapore International Water Week, Singapore International Energy Week, World Cities Summit, and Singapore Green Building Week. After 2010, we saw more international environmental NGOs setting up in Singapore, such as WWF, Earth Hour, Conservation International, Wildlife Conservation Society, Marine Stewardship Council, and Forum for the Future. This was partly due to EDB’s efforts in positioning Singapore as a hub for international NGOs. There were also informal groups being set up to advocate environmental causes and related issues such as heritage, population and food. These groups include EcoYouth, Love our MacRitchie Forest, Edible Gardens Project, People’s Movement to Stop Haze, and various groups supporting the Green Corridor and Bukit Brown. The government continued its environmental efforts that were implemented from 2000 to 2010. EDB started to position Singapore as a living lab, to encourage companies to use Singapore as a testbed for green solutions and technologies. This period is characterised by testbedding and more testbedding, with not much large-scale implementation. Since 2010, while we moved one step forward towards sustainability in Singapore, we think in some cases we are also moving 2 steps back. For example, Singapore allowed operations of a coal-fired plant in 2012, which some industry players and environmentalists questioned. The government published the Population White Paper in 2013, which triggered concerns on the increase in population and the strain on land and resources. We saw citizens signing petition after petition to try to save nature and forested areas from development, including Bukit Brown, Dairy Farm Estate, Pasir Ris Greenbelt, and Limau Estate Woodlands, without much success. In 2013, LTA announced plans to build the Cross Island Line, a MRT line that would cut across the Central Catchment Nature Reserve. Nature Society and environmentalists were concerned about the environmental impacts of the line crossing the legally protected Nature Reserve, and if an Environmental Impact Assessment would be conducted. I shared that there is a need to understand the objective of having the environmental campaign or behaviour change programme, and it is important to focus on the measurement and verification of results for that objective, so as to assess whether the campaign or programme is effective or successful. 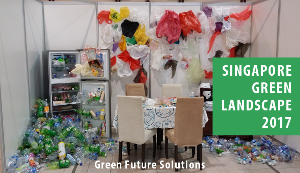 The test programme can be conducted for at least 3 months to monitor the results and analyse which parameter created the most change in the amount of recyclables collected, and more importantly, find out why it created that behaviour change either though observation or interviews. We know that the civil service is good at futures and scenario thinking and has a whole-of-government approach, but it seems that has not resulted in the systemic changes required for Singapore to be truly sustainable. We are not really tackling the tough sustainability issues that need to be addressed on a systems level, whether it is energy or food security, our increasing waste problem and the need to shift to a circular economy, or why this strategic futures planning or whole-of-government approach has not resulted in proper engagement and consultation of issues with stakeholders. I think the civil service needs to relook at how they conduct whole-of-government and strategic futures thinking. Not just to plan and forecast, but also how to communicate the important trends, ideas and necessary actions to the operational levels so that the departments in-charge of implementation are able to understand and execute the parts while thinking about the whole system. I think there is a gap between environmental awareness and action in Singapore, which we don’t have the quick answer to. We need to keep working on the environmental issues and spread the message. It would take generations to bridge that gap but we just have to keep trying to narrow that gap. One way to bridge that gap is to look at how we can introduce structured programmes on the environment. Getting someone to be green is a habit change, which requires a structured programmes to change the habit, similar to any structured programmes to get people to quit smoking or lose weight. We can’t just educate people and expect them to practise a green habit. We need a structured programme over at least 90 days (time required to form a habit) to get someone to adopt a green habit, whether it is to recycle or save energy.